In 1994, Steve Jobs was not on top of the world. Which is why he was willing to let Rolling Stone probe him at great length in this classic, must-read interview. The insights—into Steve and the industry—are astounding. "The problem is, in hardware you can't build a computer that's twice as good as anyone else's anymore. Too many people know how to do it. You're lucky if you can do one that's one and a third times better or one and a half times better. And then it's only six months before everybody else catches up. 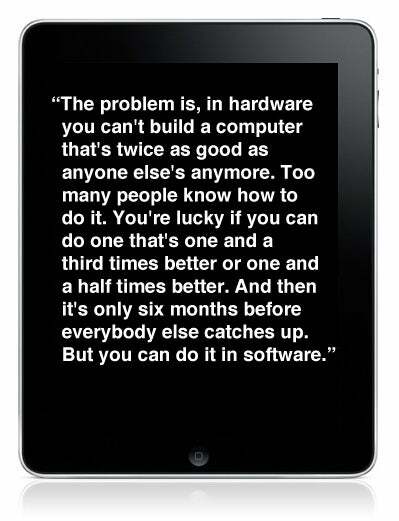 But you can do it in software." Today, everybody uses the same guts, whether it's in big computers or little ones. The same chips from Intel power Windows PCs and Macs, which didn't used to be the case. iPhones and Palms Pres and Android phones and basically every other damn phone uses ARM-designed processors. What separates them all now? Software. Steve takes a few stabby stabs at Microsoft too. Referring to the stagnancy of Macintosh in 1984, he sneers, "It's amazing that it took Microsoft 10 years to copy something that was a sitting duck. " And says that the reason consumers often don't see the benefits of a technology before businesses is because "unfortunately, people are not rebelling against Microsoft. They don't know any better."